account for a contiguous surface patch of approximately 500 A2. What is the driving force that has led nature to target this binding site repeatedly with so many diverse molecules? 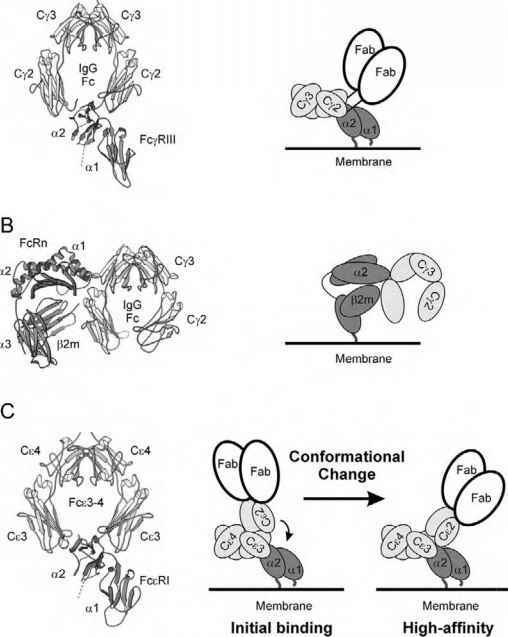 A trivial explanation would be that an important biological function of IgG, such as binding of the neonatal Fc receptor, is innately coupled to these residues. If disruption of this particular function is somehow beneficial to bacterial infection, then this hypothesis would explain why protein A and protein G binding domains have co-evolved to bind this site; however, it would not explain why rheumatoid factors are also specifically attracted to the hinge region. An alternative hypothesis is that the innate physiochemi-cal composition of this site is inherently "sticky" and promotes binding as well as antigenicity. If the biological role for protein A and G is primarly to localize IgGs to the bacterial surface, perhaps to evade immune system surveillance, then it might simply be the case that the CH2/CH3 hinge region was the most evolutionarily efficient IgG surface to target for binding. Likewise, if this region is an innately attractive part of the protein surface, then that would explain the frequent emergence of autoimmune rheumatoid factors targeting Fc. We chose to evaluate this hypothesis by evolving novel IgG-Fc binding domains in the laboratory to discover if molecules selected purely for binding would indeed target the CH2/CH3 hinge region.